Developed from criteria specifically set by the UK market, the programme for developing the Dynamic 2D hinge range took into account security, adjustability, long service life and reliability without compromising on aesthetics. An enormous range of surface finishes enables our PVC-U hinges to be matched to any door or window surface. This enables the door designer to take on board various influences on the choice of door colour. Part M of the building regulations requires door openings to enable wheelchair access and a minimum width of 775mm is specified. Hinge design can be crucial in meeting this standard. 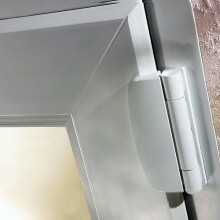 The Dynamic hinge range allows door movement of over 90 degrees, which often makes the crucial difference. The use of 'low threshold' door sills is on the increase as they are designed to meet Part M. These require very precise hanging of doors with respect to height in order to achieve a good seal. SFS Dynamic hinges feature unique adjustability in a downward or upward direction solving this problem with ease. The design is based on 'fit and forget' principles eliminating remedial work on sagging doors and damage to plaster reveals and decorations. Simple, secure fitting can be done by a single operative and requires just a common or garden electric drill and appropriate gauges. The design enables both vertical and horizontal adjustments of the door after hanging. Optimum door seal compression is achieved by the precise positioning of the door.